seense.com has been successfully migrated today to https. Inline with the new OS X El Capitan requirements! It is time to write few words about the past crazy week. It was the week of the release of El Capitan. The Clock 3 and DrawnStrips Reader 3, were in “waiting for review” mode in Apple. So for this part it was ok. I had to complete 2 major things this week. To finalize the design and coding of the new website, and to complete Barsoom 2. I needed first to find an idea about the design, colors and other things that make a seense website a seense website. So finally between Sketch and CodeRunner the website was starting to look like something. All in all today, after few weeks the new website is ready, and the migration seems to have been apparently ok. It is now ready to be migrated to https next week. During this week, Apple rejected both The Clock 3 and DrawnStrips Reader 3 for a “stupid” false/positive of private API use. This is something that I started to get recently, maybe a year ago. If you use an ivar which looks like a private one, then it is detected as a private API use. So, just change of a little name, and send back to Apple my apps. Back in “waiting for review”. It is normal, and it is ok.
Ok. To be clear, I’m using Barsoom on daily basis. I like it ;). It is simple, and do what I need. Keep The Clock on the right side of my screen and I’m able to hide some items that I need, but do not need to see. I’m now almost done with MenuBar Stats 2. And the new MenuBar Stats 2, gives you the option to have 1 big item with all the sub-item inside (CPU, Memory, Battery and othe future plugins…) or to have all these babies in a separated mode. Plenty of little independant icons and separated windows. As MenuBar Stats 2 is aimed to be sent to the Mac App Store, there is no way to move these little babies around while within the App Store rules. And I added a big new feature, which is “1 Click Hide”. Basically, select “1 Click Hide”, and everything on the left side of the Barsoom icon is hidden. select “1 Click Show” and everything come back. Neat if you have a presentation, or need to take some screenshots. I still didn’t find a way to move the Apple Menu Extras in El Capitan, but still looking for a solution. I think Barsoom 2 is a quite solid app. You can download and get the 2 weeks trial to check on your own. Now Barsoom 2, can be bought at 6.99$, or still offered, as before, to the seense customers of other apps. And of course, Barsoom 2 is a free upgrade to all the existing customers of seense apps. So this was my week. Now, let’s see the feedback about Barsoom 2 and the other apps. The long awaited upgrade is finally coming, and will be available this Fall with El Capitan release. 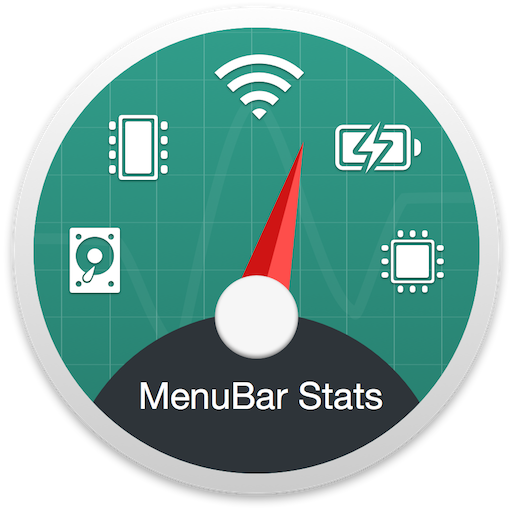 MenuBar Stats 2, is a 100% rewrite for Yosemite and ElCapitan. MenuBar Stats2 has been developed with El Capitan in mind, is 100% flexible, and developed around a 100% plugins architecture . Few screenshots before the release of the new MenuBar Stats 2. So over the years, I took all these feedbacks into account, and I made The Clock grows based on customers suggestions. The best suggestions were always implemented. The Clock started as a basic world clocks with a calendar. And with the years, many more professional and useful features have been implemented to answer your need. Today, 4 years later and after many upgrades, The Clock is a strong app, with an average rating of 4.5/5. The Clock customers are very happy with it, despite no coverage on the different media, but my main target is my customers. So this one is, I think, achieved. But, I always see room for improvement. This last year 2015, many new interesting suggestions were made. But after all these upgrades for the past few years, it was difficult to integrate nicely new major features. 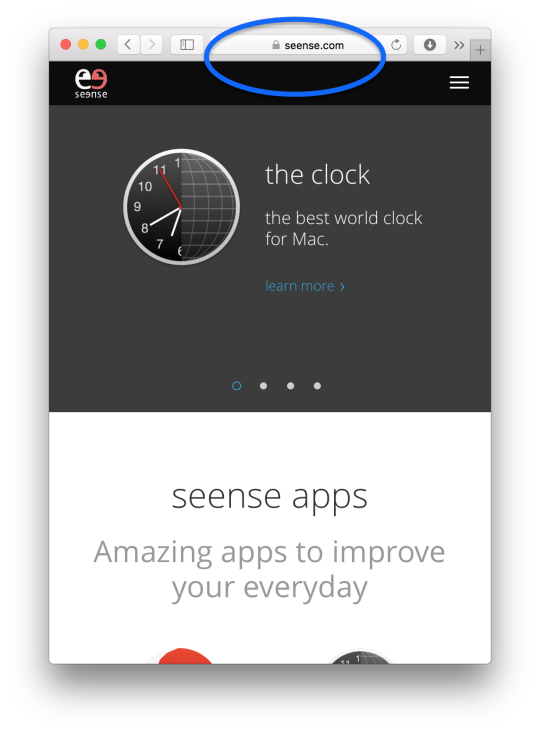 And I didn’t want The Clock to be sold without any upgrades for months/years to come, as many apps out there. So, few months back I decided to do something crazy. To start all over again. And to go against the rule don’t fix, something which is not broken! Yes I know, it is a big risk. Because the rule don’t fix, something which is not broken is a strong rule and is there for a reason! But even if from outside The Clock is not broken, from inside it was difficult, as mentioned earlier to implement new major nice features. And sometime you need to take risk, and take a leap of faith. So, it was decided. Let’s go back to the black board. The target, keep it simple but powerful. Keep the beloved features. Clean few existing quirks. And to re-code everything and architecture the app in a way that the future suggestions will be easy to implement. The minimum OS X version needs to be changed to Yosemite, too. Too many changes took place between Mavericks and Yosemite to have an app 100% ready for tomorrow. So few months later, and 40K brand new lines of code later, the first beta is ready to go live. From outside, the The Clock 3 looks familiar. But from inside 100% of the code, and 100% of the graphics changed, except The Clock Icon. I like it ;). So in the first few betas, there will be few new quirks to correct. But I’m confident that the decision is good for the long term. So more than ever The Clock is the Best World Clock for Mac. Easy for personal use, and strong for professional use. PS: The current The Clock, and the beta can be run in parallel. They will not interfere with each other. 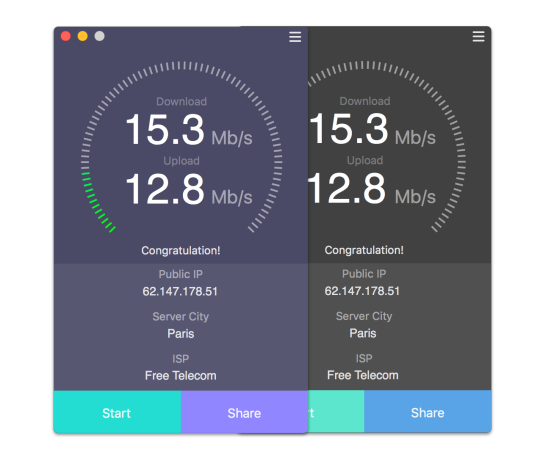 Speedy (FREE), quickly check your Internet connection speed. The future release OS X 10.11, El Capitan, is introducing a great new feature the System Integrity Protection. Basically, this new feature protect the system files and the system processes. But by protecting the system processes, it means unfortunately the end of full tweaks for the menu bar. Barsoom and MBRA2 work by injecting a small code into processes, to place your items as you wish. This still work beautifully with third party apps in El Capitan but not with system processes such as the Menu extras, Spotlight, and Notification Center. These items are now protected against code injection. The system items (Menu extras, Spotlight, and Notification Center) will remain on the right side of your menu bar, no matter what, as they cannot be controlled anymore. But you will still be able to rearrange your third party apps. Despite this drawback you can still place The Clock on the right side of your menu bar. Between Spotlight and the Menu Extras for example. You are able to turn off the System Integrity Protection, but I do not recommend it, as this feature is bringing a real additional protection to your system. I spent the last 2 weeks to try to find other ways to be able to rearrange your menu bar, but after 2 weeks of coding/testing and many options tried, I’m not happy with the end results. I will continue to investigate, but I’m not confident that a nice solution can be found. I agree with people from Tunabelly Software and BinaryAge, that developers with a Developer ID could be allowed for injection code (ala KEXT signing program). But as mentioned by people from Tunabelly Software, OS X is slowing being closed off as iOS. So I don’t think this will happen anytime soon. I will continue to maintain Barsoom and MenuBar ReArranger 2, as they still bring add value, and still mostly works properly with any third party items. And for my customers using Barsoom to place The Clock on the right side of the menu bar, this is still working. Today, seense Introduce “Webapp Series”, Because, sometime, a web browser is not the most convenient way. The “Webapp series” is a family of well crafted web wrapper apps for Mac. What are ‘Webapp series’ key features ? # Access quickly from your menu bar or the Dock. # Access quickly from a keyboard shortcut. # Start or not automatically at login. # Choose or not to keep the webapp window floating above others. # And more features depending on the webapp. The 2 first members of the family are Webapp for Youtube and Webapp Translate, which I hope you will like. They have been crafted with a high focus on details and usability. The Webapp Series family members will evolve with the time. I have already few exciting features in dev for the future releases. I will be happy to get your feedback, in order to include your best ideas into the future releases. And of course, the Webapp series apps gives you exclusive access to Barsoom, the FREE add-on to keep your menu bar in order. Keep you menu bar in order. Command + drag all your menu bar items. Barsoom the magical add-on to keep your menu bar in order. Today 10 March 2014, seense released Barsoom, the magical add-on to keep your menu bar in order. Barsoom is a FREE and Exclusive add-on for The Clock and MenuBar Stats customers. Once Barsoom add-on is installed on your Mac, you will be able to drag all your menu items around! Including out of the menu bar to close them! And of course a consistent ordering between restart. Barsoom gives you a quick access to enable/disable the Apple menu extras. No need to look for in which part of your system preferences, the enable/disable button is hidden! You need to have The Clock or MenuBar Stats running on your Mac to use Barsoom. Barsoom is a Free and Exclusive add-on is for The Clock and MenuBar Stats customers. In the coming weeks, I will extend the Barsoom add-on exclusivity to more seense products. I hope you will enjoy Barsoom.